When I was in high school, I hated color. My mom (who always knows best) would try to show me beautiful bright things that would make me cringe. Cheery yellows, bright cerulean, poppy pink and, of course, red. I would always shrink away and pick something grey or pastel instead. She was right, of course, as she’s always had an innate fashion sense. As for me? I just wanted to fit in. The idea of standing out in such a way—in a bright bold, head-turning color—made me feel so so uneasy. I realize now that it was me, not the color, that was the problem. My own fears and insecurities and all-around being uncomfortable in my own skin that kept me away from color! When you think about it, that’s just plain silly. But I also know I’m not alone in this feeling. Color can empower you, and it can alter your mood, your vibe, how you’re perceived in the world. Being unafraid to stand out says something–and that was absolutely something I wasn’t ready for at a young age. Now, my wardrobe is still a lot of naturals: black, white, grey and soft colors are part of my every day uniform. But, color is welcome, too. I’m sure it has to do with age and confidence. Something that you can only gain with time. 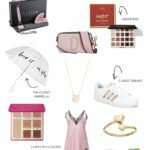 But if you’ve ever felt like color or the fear of “standing out” has steered you toward neutrals, I challenge you to give it a try this spring! There’s something beautiful about just owning color. Whether it be an all over red jumpsuit like this or a bright red lipstick. You can choose a statement piece or accessory, too, and dip your toes into the idea. Whatever you choose, I encourage you to try a little color this season, it’s fun and not-so-scary! Once you get used to it that is. This red halter jumpsuit I actually purchased for a Valentine’s Day date (and then never wore it.) It comes in 7 colors and is so flattering with the high-neck and low, exposed back! I may get one in black, too, as it’s pretty much a wardrobe staple. And, a few softer colors like blush pink. You can get it at Lulu’s or Nordstrom. I styled it with my reversible Louis Vuitton belt, just to add a bit of something-something. It does run long (I am 5’4 and wearing a size small) so if you’re on the shorter side like me you may need to hem it a bit. This red jumpsuit is a keeper since the cut is so classic; you could wear it to a summer wedding or a date night, too. Or, on Friday…because now that I’m older, wiser and not as fearful of color, red can be rocked just about any day. 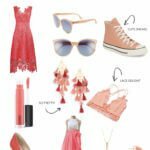 Tell me: How do you feel about the color red? Do you wear bold colors or steer away from them?? So glad you embraced color! I had a similar phobia, for the same reason, in high school. Then in college I went through a rough breakup and for some reason, it gave me new life and my wardrobe transformed! In place of the blacks and browns I was sporting lots of pinks and orange and vibrant greens! lol, my roommates were a little concerned but I never went back! I’m glad about it now and would totally rock that beautiful red jumpsuit! Isn’t it funny how a transformative event can change your whole outlook on fashion? Thanks for sharing your story, I’m glad to hear how it worked out in such a postive way! Yay color! Well you look absolutely STUNNING in red! Oh, well thank you so much! That jumpsuit is gorgeous on you! 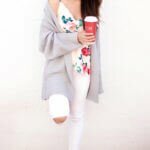 I love basics and neutral colors but am learning how to incorporate more colors into my wardrobe! I love my neutrals too! Thanks for stopping by and the kind compliment. Red is such a powerful color and looks amazing on you! Love your chic jumpsuit! I’ve always been the same way, give me all the neutrals. I’ve been trying to get out of my comfort zone more and more by adding some new color pieces. This jumpsuit is just gorgeous! It’s fun to mix in a few bold pieces, you should try it! This color looks gorgeous on you! I love the open back detail. Confidence really allows us to be who we want to be. Totally agree that it comes with age (for most). So gorgeous in this red look!!! Love your shots!! You look AMAZING in this jumpsuit! The red looks so fab on you and I love the back of it! Thanks, Kim! So sweet of you to say. Appreciate you stopping by. You look amazing in this red jumpsuit! This is perfect for Spring and the color looks fabulous on you! Thanks, Laura! I appreciate your kind words. I love standing out with colorful outfits! This red is stunning on you! I couldn’t possibly be afraid of color – I love it! Especially red! It’s just such a power color. It makes me feel amazing when I wear colorful, bright clothing! Girl, this jumpsuit is fire on you! I love this color, so vibrant! I rarely shy away from colors, they are a fun way to give your outfits lots of personality and while I might be happy with a sea of greys, whites, and pastels, finding something bold and wearing it with confidence is the best. I love a red jumpsuit! It is so eye catching and bold. These photos are stunning. I love neutrals, too, but I’ve embraced soft colors over the years — except for red. I’m just not that into it. But I must say that red is certainly your color, girl. Gorgeous open back jumpsuit! Thank you! That’s so kind. Red definitely isn’t for everyone, but if you’ve found the colors that work for you that’s fab! And if you like this open-back style, it comes in a bunch of colors! Including one of my personal go-tos: BLACK! I felt the same way about colors when I was in high school and for the same reason! I was afraid to stand out because then I might end up with a target on my back for teasings or bullying. I felt that being ignored was way better than standing out and potentially getting made fun of. Now? I love and embrace color! I really love that fiery jumpsuit! So chic on you! Thanks for your comment, Deborah. Happy to hear I am not alone in feeling this way! I do think it’s something a lot of us “grow out of”. Hoping I can inspire my daughter to be bold and herself no matter what. I’m all about some color and this red is gorgeous on you girl!! Work it! 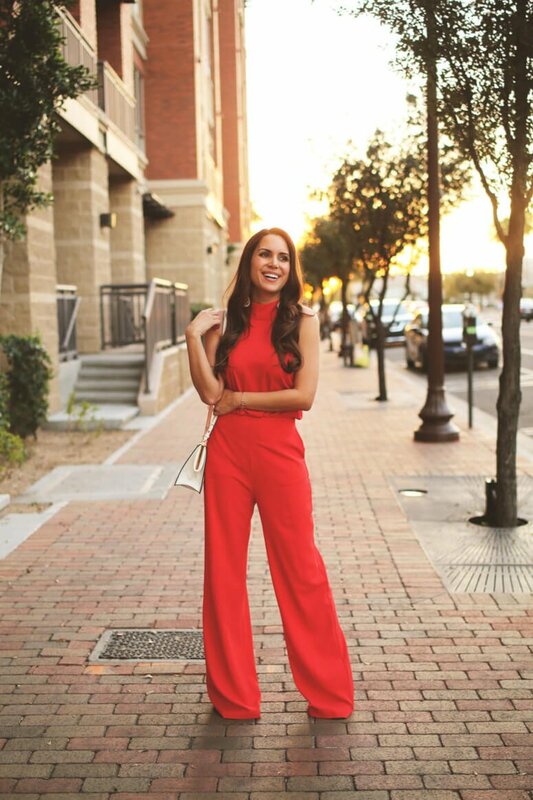 I am totally guilty of shying away from bright colors too — but this bold red jumpsuit is SO beautiful! This jumpsuit looks so good on you! I love how you styled it. I am loving the red on you girl! It’s perfect for Spring, jumpsuits are so much fun to style. Well you are totally rockin the red girl! Loving this jumpsuit, so cute for Spring! Love that you’re not afraid of color, you look amazing in red!